The 100 square meter Vacheron Constantin boutique honours the Maison’s heritage as the oldest Haute Horlogerie manufacture in the world. The boutique welcomes watch enthusiasts and collectors with a warm and bright elongated façade made of refined antique brass and beige marble. Embracing the main entrance are four double-sided showcases that offer an exhibit of the exquisite collections and and highlights boutique exclusive pieces. 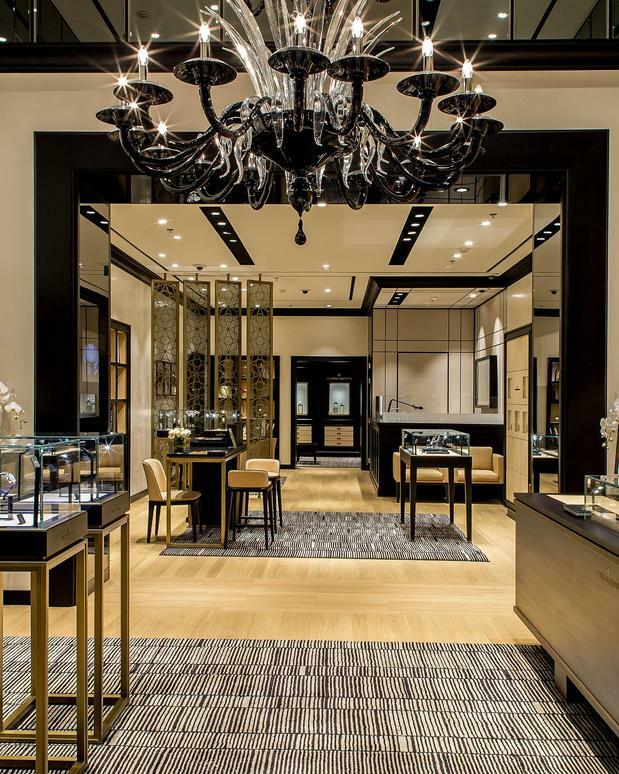 While the exterior exudes serenity and sophistication amidst Wynn Palace’s architectural grandeur, the boutique’s interior design and ambience echo with Vacheron Constantin’s high level of Haute Horlogerie craftsmanship and finishing embodied in the Manufacture’s timepieces. In tune with Vacheron Constantin’s constant search for technical excellence and aesthetic perfection, the interior design emanates an intimate and comfortable atmosphere with a white art-deco style Murano glass chandelier custom-made from Italy and an elegant natural wood finish: a prominent oak wall, followed by a walnut colour scheme for the furniture, mirrors, wall paper and marmorino. The boutique is set on 75 square metres and offers a small salon with curved showcases and a glass ceiling to explore the Manufacture’s heritage, the transmission of know-how and high quality craftsmanship. The boutique further features a VIP lounge to allure watch enthusiasts and collectors to further appreciate the culture, history and tradition of excellence that defines Vacheron Constantin.